In the last 28 days I’ve averaged five hours sleep per night. And no, I don’t have a newborn. A few weeks ago I went on a child-free girls’ trip to New York where I existed mainly on Margaritas and Bloody Marys, so the sleep deprivation was kinda self-inflicted. And back at home, I’ve had a couple of kids who’ve committed to stealthily creeping into my bed each night, waking me at odd times with a body little limb poking into my belly or a teeny tiny foot in my face. So right now my skin deserves to look like crap. But instead – amazingly – my skin looks better than it ever has. 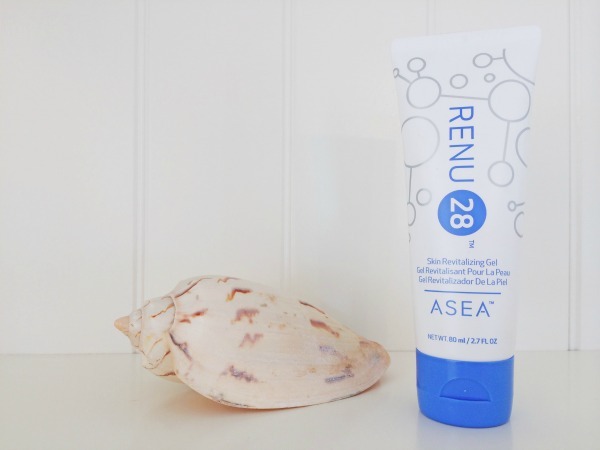 During the last month my basic skin care and cosmetics have remained the same (you can read about them here) but I’ve added a new product to my routine that has made a significant difference to the quality of my skin, called RENU28. When I was sent this product to try I’ll admit I was a little bit sketchy about it, because the idea is that you smooth the gel over cleansed skin, and follow with your regular beauty routine day and night. Basically I loathe the idea of adding another step into that process, as who has time for extra fussing? Also, I’ve trialled a bunch of other serums, potions and gels over the last three years as a beauty blogger that not only don’t make a difference to my skin, but can leave it with that kind of wet-bread-crumby finish that you get when you’ve used too many products. But, RENU28 absorbed into my skin quickly (so didn’t eat into my precious morning-coffee-gulping time, or my before sleep read-in-bed time), and despite the sleep-deprived beating my face has been given over the last month, my skin actually looks fresher and younger. The easiest way to demonstrate is by sharing a few random selfies taken over the last 28 days. Obviously the lighting and angles are different, but I think you can easily get the gist from these un-retouched, un-filtered, and un-glamorous snaps that I grabbed off my phone.